The Deriner double-curvature concrete arch dam is located on the Coruh River. The powerhouse is located underground on the right bank of the river. Photo courtesy of ERG Insaat. 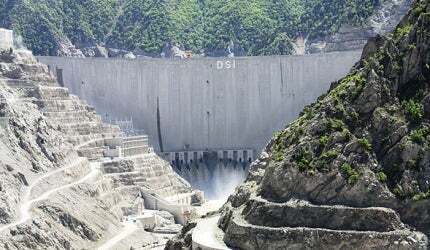 Construction on the 670MW powerhouse near the Deriner dam was completed in February 2013. The powerhouse is 20m-wide, 126m-long and 45m-high. The underground powerhouse near the dam houses four units, with an overall capacity of 670MW. Commissioned in 2013, the powerhouse annually generates 2.118GWh of electricity. "The project is owned by Turkey’s State Hydraulics Works (DSI) and was constructed by a consortium led by ERG." The project is owned by Turkey’s State Hydraulics Works (DSI). The power plant was constructed by a consortium led by ERG, and required an estimated investment of $1.39m. Construction on the dam began in 1998. The project work involved constructing the dam’s body, rock excavation, diversion tunnel, underground powerhouse, overflow spillways, access roads and internal roads. The concreting work began in 2005 after the completion of excavation process, but was stopped between 2007 and 2008 due to lack of funding. However, the work was resumed in the last quarter of 2008 and completed in February 2012. The HEPP is located on the right bank of the river near the dam. The completely underground powerhouse features four vertical Francis turbines and generates 2.118GWh of electrical energy annually. "The electrical energy generated by the plant amounts to 1.1% of the total energy production in Turkey." The electrical energy generated by the plant amounts to 1.1% of the total energy production in Turkey. The powerhouse is 20m-wide, 126m-long and 45m-high. The turbines in the plant are fed with water through a 9m-diameter penstock. Water from the turbines is then exited through 74m-long tunnels. The Deriner dam is a double-curvature concrete arch dam. It is 249m high from the foundation and 202m from the river bed and has a crest elevation of about 397m. The dam has a concrete volume of 3.5 million cubic metres. The diversion tunnel is 898.14m-long and has a capacity of 1.804 cubic metres a second (cusec). The overflow spillway has a capacity of 2.25cusec while the orifice spillway has a capacity of 7cusec. Turkey’s State Hydraulics Works (DSI) owns the project. A consortium comprising ERG Construction, Technopromexport, Stucky, ALSTOM, Sulzer Hydro and Hydro Vevey was responsible for the construction of the project. The consortium of Poyry (formerly Electrowatt Engineering) and Dolsar Engineering designed the dam and the powerhouse under an approximately $24m contract. The consortium was also responsible for providing quality assurance throughout the project. The funding for the project was attained in 1997 and construction began in 1998. The excavation and construction of the dam’s foundation necessitated a diversion of Coruh River, which was completed in 2005. The diversion was done through a horseshoe cross-section tunnel on the right bank. The Deriner site consists mainly of granodiorite rock with a certain amount of diabase dykes. The decompressed and heavily jointed rocks existent in the upper layer necessitated a huge amount of excavation to be undertaken. The excavation work was carried out by drilling and blasting using the pre-splitting method. The initial sections of the foundation were, however, excavated using a controlled blasting method. Pre-stressed anchors were used in some cases. Natural slopes totalling 430m in height from the right bank, 480m in height from the uppermost part of the left bank, 29 berms at the right bank and 33 berms at the left bank were excavated. Associated infrastructure such as roads, tunnels and bridges were also constructed as part of the project. Hydro and marine power energy is making a splash worldwide – but which country has the most potential to capitalise? Itaipu Hydroelectric Dam is the largest operational hydroelectric energy producer in the world, with an installed generation capacity of 14GW. The Three Gorges Dam Project (TGP) is the world’s largest hydropower complex project located in one of the three gorges of the Yangtze River. Turbologistics is a buyer and seller of new, used and refurbished surplus gas turbines, gas turbine parts and related turbomachinery.